Pest description and crop damage Adults are brick-red with six black spots on each wing cover. Eggs are green and deposited singly. Larvae are cream color with a light brown head. They most frequently are found inside the berry on female plants. Pupae are light yellow in a silken cocoon. Because larvae feed on the berries, infestations of the spotted asparagus beetle are less damaging than the asparagus beetle for fresh market and processing asparagus. 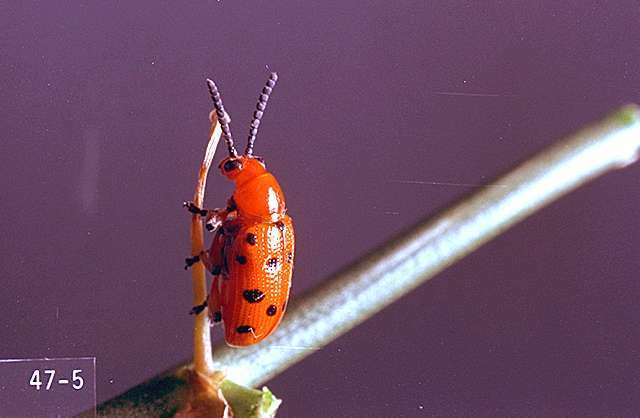 However, the spotted asparagus beetle can be a major pest in seed production fields. Biology and life history The spotted asparagus beetle overwinters as an adult and begins feeding immediately following emergence. Egg laying starts approximately 1 week after emergence. Eggs are oval and attached to the fern plant by the side. Larval feeding takes place primarily in the berry and lasts for 10 to 14 days and four instars. Mature larvae crawl to the ground and burrow within the soil, where they spin a silken cocoon in which to pupate. There are usually two generations each year. Pest monitoring Spotted asparagus beetle adults rarely do damage to the spears and do not need to be treated. Larvae damage to seeds is of concern only when asparagus is grown for seed production. kaolin-Applied as a spray to foliage and stems it acts as a repellant to some insect pests Some formulations are OMRI-listed for organic use. carbaryl (Sevin 4F) at 1 lb ai/a before harvest and 2 lb ai/a post harvest. PHI 1 day. REI 12 hr. Do not exceed 5 lb ai/a per year. Latex-based formulations, such as Sevin XLR Plus, are less hazardous to bees. permethrin (Ambush 25WP, Pounce 25WP) at 0.05 to 0.1 lb ai/a. PHI 1 day. REI 12 hr. Do not exceed 0.4 lb ai/a per year. Retreatment interval 7 days. spinosad (Success, Entrust SC) at 0.062 to 0.094 lb ai/a applied after harvest. PHI 60 days. REI 4 hr. Do not exceed three times in a 30-day period or per season. Do not exceed 0.28 lb ai/a per crop. Do not feed treated ferns to meat or dairy animals. Ferns only. Entrust SC is OMRI-listed for organic use.